NETWORK UPDATE: AMERICA’S GOT TALENT gained 0.1 in final numbers, and HOLLYWOOD GAME NIGHT lost the same. Also, as expected the CW reruns each went down 0.1 after the sports preemptions were adjusted out. CABLE HIGHLIGHTS: The TYRANT season finale (FX) didn’t excite anyone, dropping 0.05 to 0.37. However, some people showed up to find out who the killer was on MTV’s SCREAM, which gained 0.06 to 0.34 (and was up 0.06 in the F12-34 demo as well, to 0.60). The midseason finale of TNT’s RIZZOLI & ISLES leaped 0.19 to 0.82, yet PUBLIC MORALS fell 0.03 from last week’s premiere to 0.25. Elsewhere, OWN’s THE HAVES AND HAVE NOTS led Tuesday cable, down 0.04 to 0.94. On Spike, INK MASTER rose 0.07 to 0.82, and TATTOO NIGHTMARES jumped two-tenths to 0.58. History’s COUNTING CARS was at 0.61/0.52, in the same range as last week’s 0.59/0.53. TOSH.0 (Comedy) dropped 0.12 to 0.55, and then DRUNK HISTORY returned at 0.33. E!’s TOTAL DIVAS gained a tenth to 0.49. On Bravo, BELOW DECK was up 0.05 to 0.47, with lead-out MY FAB 40TH at 0.21. Food Network’s CHOPPED TEENS rose 0.05 to 0.46. BAD GIRLS CLUB (Oxygen) climbed 0.11 to 0.44. On TLC, LITTLE PEOPLE BIG WORLD lost 0.16 to 0.41, and OUR LITTLE FAMILY fell 0.04 to 0.30. History’s OUTLAW CHRONICLES was up 0.02 to 0.41. 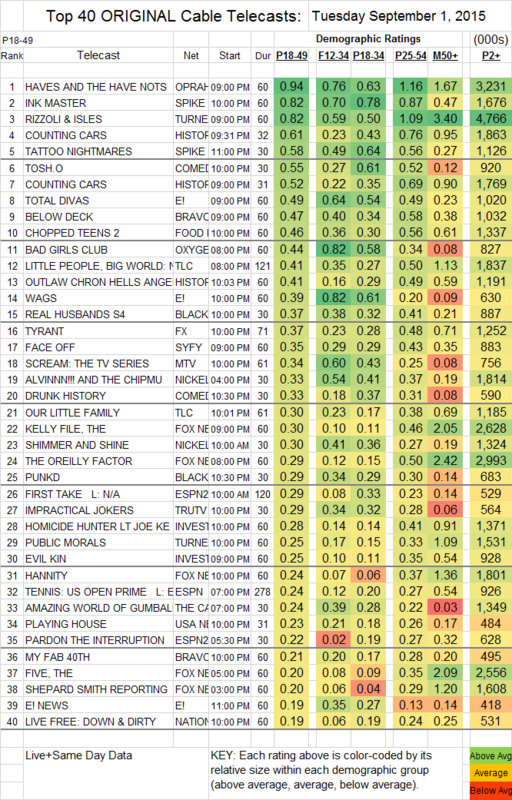 REAL HUSBANDS (BET) dropped 0.07 to 0.37, and PUNKD shrank by 0.06 to 0.29. Syfy’s FACE OFF lost 0.03 to 0.35. PLAYING HOUSE (USA) picked up 0.06 to 0.23. At ABCFamily, there was a smidge of good news for the unscripted slate, as MONICA THE MEDIUM was up 0.05 to 0.19, NEXT STEP REALTY was also up 0.05 to 0.09, and even STARTUP U was up 0.01 to 0.03 (with 63K total viewers). BIG BROTHER AFTER DARK (POP) was at 0.05/136K.